Still searching something beauty in Bali? 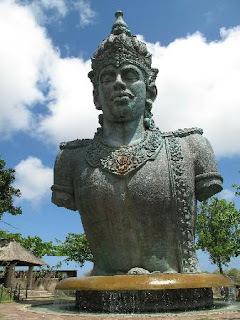 Try this place: Garuda Wisnu Kencana Cultural Park - Bali Indonesia. Americans can be proud to have the Statue of Liberty is tall statue and its foundation is 92 meters (about 46 meter high statue and its base about 46 meters). However, Indonesia would soon surpass the symbol "independence" of America. Yes, a large statue of mega-projects that can be enjoyed most of the results are currently being built in Bali, exactly in Bukit Ungasan, Jimbaran, Bali. 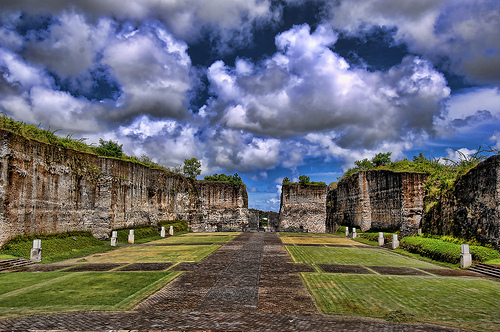 This prestigious project is called Garuda Wisnu Kencana Cultural Park. From the name, it appears that that will be built is a park with a monument of Lord Vishnu who was driving a Garuda bird with golden color (gold = gold). Lord Vishnu himself is a symbol of caretaker of the universe, while the bird Garuda is a symbol for freedom, loyalty, and selfless devotion. The plan, the statue of Lord Vishnu riding Garuda was built at a height of 75 meters, with a foundation as high as 70 meters. Garuda bird wing will also be stretched as wide as 66 meters. Key ingredient is copper and brass sculpture with the overall weight of about 4,000 tons. Later, if the project is completed, the Garuda Wisnu Kencana monument will stand as high as + 145 meters beyond the height of the Statue of Liberty and can be seen from the radius to 20 miles. Garuda Wisnu Kencana (GWK) is indeed planned to become an icon for tourism in Bali. Today, tourists can enjoy this GWK Cultural Park. Statue of Lord Vishnu who erect half-body (without hands), and the head of the Garuda bird has become a spectacle of thousands of tourists each month. GWK area itself is a rocky limestone hill with an area of ​​about 200 hectares. Previously, the area named the Bukit Ungasan is barren hill that is not much known for not having any tourist charm. However, after the monument was built, this area started growing and increasingly taken into account. 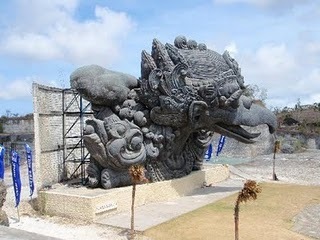 This gigantic statue was designed by a leading sculptor from Tabanan, Bali, I Nyoman Nuarta. Sculptor Nyoman Nuarta is a graduate of Institut Teknologi Bandung (ITB) who gave birth to monumental works, such as Monument and Monument Proclaimers Arjuna Wijaya of Indonesia in Jakarta, as well as Monument Jalesveva Jayamahe on the beach north of Surabaya. GWK Cultural Park is located on top of limestone hills as high as 263 feet above sea level (asl). From that altitude, coupled with high statue and its foundation later, the Garuda Wisnu Kencana Monument will be the charm of the island of Bali which can be seen from a distance. Above the height of Bukit Ungasan, you can also see the expanse of the southern part of Bali Island with beaches overlooking the Indian Ocean. While in the north, visible fro the plane at Ngurah Rai Airport as well as views of Denpasar. Enjoy the natural charm on Ungasan Hill is going more and more complete if you take the time to watch the sunset (sunset). Through the trail toward the statue of Lord Vishnu, you will be amazed once again with big plans designer to sculpt in limestone hills into relief the epic Mahabharata and Ramayana. Limestone hills has now been 'transformed' in such a way into big blocks, and some of them have started to be chiselled. Of course, this major work will also bounce back the image of Bali as an island resort in the eyes of the world. Not only that, near the statue of Lord Vishnu, there is a sacred spring that is named Parahyangan Somaka Giri. Water source was believed to cure various diseases because it has a very good mineral content. Residents around have long been using water from these Giri Somaka Parahyangan for treatment. If there is a specific event, you can also enjoy various art and cultural events in this place. From the beginning, GWK Cultural Park is designed to be one of the prestigious venues in Bali. At the Lotus Pond stage, for example, with an area with a capacity of 7,500 people, this location can be used for musical performances or performing arts are colossal. Not to mention the Street Theatre, Plaza Tortoise, and the Exhibition Gallery which can be used for purposes such as musical performances, exhibitions, and even fashion shows. GWK Cultural Park is located in Bukit Ungasan, on Jalan Raya Uluwatu, Ungasan Village, District of South Kuta, Badung regency, Bali province, Indonesia. Sightseeing GWK Cultural Park is located on the southern island of Bali, about 40 kilometers from Denpasar, capital city of Bali province. From Denpasar City, tourists can use the services of taxis, rental cars and motorcycles, or use the services of travel agents to bring tourists to the location. An excursion to the pedestal is generally a single travel package tours with other tourist resorts in southern Bali, like Kuta Beach, Nusa Dua Beach, Beach Dream Land, Tanjung Benoa, Jimbaran, Uluwatu Pura Luhur, as well as other tourist resorts. The travelers who want to enjoy this magnificent park and monument ticket charge of Rp 20,000 per person. If bringing a private vehicle, then there is an additional levy, which amounted to Rp 5,000 cars and motorcycles USD 2,000 (March, 2008). GWK Cultural Park has been equipped with various facilities, such as the Lotus Pond, Garden Festival, Amphitheater, Street Theater, Exhibition Hall, restaurants, and souvenir shops. This cultural park also has several plazas or roomy place outdoors. One of the many visited by tourists is displaying a statue of Vishnu Plaza body of the god Vishnu. At the Plaza is also often the location of pre-wedding photos. If interested in having dinner in this area, it would not hurt you to try having dinner with a la hindangan Indonesia and abroad under the auspices of the stars.